Quilotoa Lagoon is located in Zumbahua parish at the west of the Cotopaxi province. It is part of “Los Ilinizas” Ecological Reserve. This lagoon is located in the crater of Quilotoa volcano and arose from the eruption of it. One of its main attractions is the turquoise color of its waters, one fact that makes of this lagoon an Andean tourist attraction highly desired by national and international tourism. In this note, we want to tell you about one of the legends of the Andean region around this majestic lagoon, which we recommend you to visit if you are in Ecuador. Legend has it that Pachacamac, God creator of the universe, created a sacred bird known as the condor whose function was to be the messenger between spirits and humans. The condor used to flew carrying the news that joined the sky with the earth, and while he was doing this he started to feel alone. Cover photo of José Alfonso Toaquiza Ugsha’s work. One day, the condor saw a beautiful young girl who was sheep grazing in the moor and he fell in love. Since he wanted to look elegant, the condor stole the poncho of a sleeping shepherd pretending to be a human. Then the condor climbed the shepherdess on his wings. She felt the freedom of the heavens and fell in love with the condor. They went together to the nest and the condor ended up turning the young girl into a condor. It is said that they fly together over the province of Cotopaxi. The Andean condor has been an eternal witness of the events in these highlands located at 3,900 metres above sea level, and it is expected to continue flying around this impressive lagoon. While this beautiful love story between the shepherdess and her beloved condor is remembered through the music of happy flutes and charangos. Book your Quilotoa Tour of Quito Tour Bus! 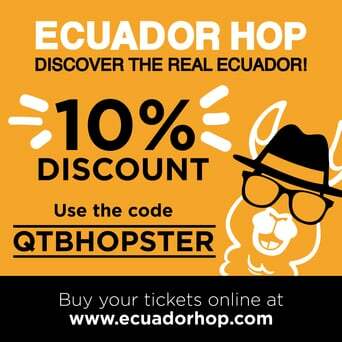 A simple and fun way to get to this unique natural destination of Ecuador. You can visit Shalalá Lookout where you can admire the beautiful Quilotoa Lagoon with its incredible turquoise waters and, later, you will hike to it. In addition, you will visit the craft shop on Tigua community, and Toachi Canyon Lookout with almost 30 kilometers in length and a drop of 100 meters. It offers an unusual Andean landscape due to the eruptions of Quilotoa volcano. Do not miss the opportunity to experience this place through our Quilotoa Tour. If you are lucky, it is possible that a pair of condors appear over there. Photos Credit: The Naïve Art created by Julio Toaquiza with Olga Fish in the community of Tigua Chimbacucho. Toaquiza family is a pioneer in Naïve Art with their son Alfonso Toaquiza and Sinchi Toaquiza, leaders of Tigua painters. They represent and transmit the Ancestral Knowledge to tourists through the center of cultural interpretation “Kuntur Wasi”.